When time is money, why not spend your time more wisely? 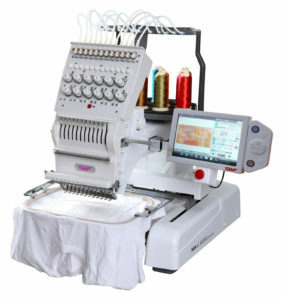 YES Ltd now offers the brand new and exciting SWF MAS-12 single head automatic embroidery machine. This smart embroidery system, which is patented by premium global manufacturer SWF, frees up the operator’s time to perform other tasks by directly converting images and designs to embroidery data in an instant and without the need for further editing. The incredible MAS-12 allows you to complete job runs in no time at all and there is no need to purchase additional digitising software to complement your machine, which cuts down on costs and streamlines business process automation. The MAS-12 makes it easy for beginners to embark upon their new embroidery journey, and with a catalogue of additional benefits such as float stitch function, automatic trimming and upper/lower thread break sensing, this machine makes embroidery a start-up entrepreneur’s dream. Newly developed motor driven under bed trimming systems. Larger stitch lengths at higher stitching speeds. Larger design and stitch memory storage. Built in power failure recovery. Narrow arm for shirt pocket embroidery. Optional quick change cap frames. Built-in oil lubrication system to reduce downtime to zero. The industry gaining momentum in terms of fast fashion and customisation, so ensure you outpace the competition with tempo and flair.